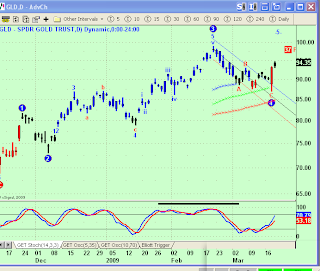 (3) Blue Wave Red Sell Signal (closing bar, Tuesday). All of these are taking place under the channel that was broken on Monday; looks pretty bleak no matter how I look at this chart. Anything can happen, but the probabilities are clearly for new lows under Monday's low. There you go, have at it. The folks at Elliott Wave International are pretty certain that the equity markets are in a multi-month Primary Wave 2 Up. I understand their analysis and have a hard time arguing with it, but, will anyway. 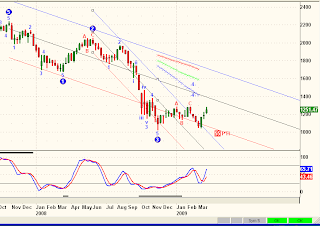 I've drawn two regression channels on the chart. The big one is down from the actual start of the Bear Market. The smaller one is a Wave 3 channel, down from the end of Wave 2. While prices have risen to break out of the smaller channel, they still have a long way to go to the top of the bigger channel and still haven't crossed the mid-section of the big down channel. 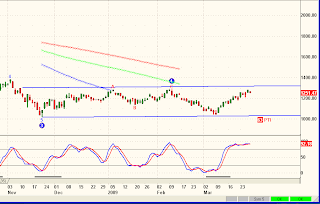 Near the top of it's sideways channel and an overbought stochastic. I know this analysis is in the minority right now. I know a lot less about the nuances of Elliott Wave then the big guns in Gainesville. But these Nasdaq charts are cautioning me that all this bullish sentiment out there ("largest monthly gains in history") is a fade. With prices meandering up in the middle of the channel, there isn't much new to add to previous analysis. 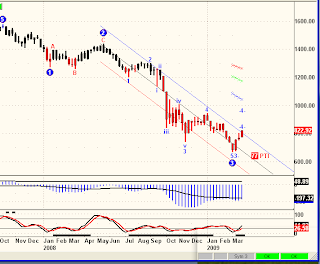 A break of either channel line will lead to a very profitable few months. Which way? While prices are contained in this channel, expect the rally to continue. A fall from grace out of the channel would have very negative connotations. Below is a picture of both the previous Down Channel and it's giving way to this new Up Channel at the beginning of March. Those printed prices on the chart are Blue Wave Buys and Sells. Charts aren't for everyone, but for me, they are an essential map for all time frames. Tonight's 240 minute S&P chart, with EW, BW and the Up & Down Channels, is an excellent example of how these tools can all come together to point the trader in the right direction and maybe more importantly, provide an alert when prices act contrary to existing trends. Lots of angst about NanoViricides in my emails, comments, even phone calls from resourceful strangers. Each 10,000 shares of NNVC will be worth $1M within five years. Those 10,000 shares cost $5,800.00 at current prices. Some personal matters necessitate an abbreviated post tonight. In fact the daily postings are in jeopardy for various and sundry reasons, including but not limited to taxes. So quickly, here is how I see things. 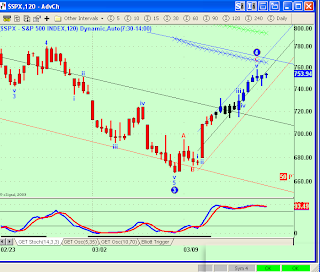 Above is today's BW Trend 30 minute chart. That first long blue bar was pre-market, but there was immediate follow through so the system was long all day, into the close. 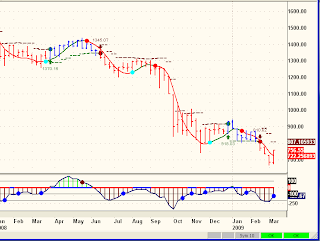 Above is the Weekly EW chart. Note that today's bar has broken out of the long term regression channel coming down from the Wave 2 Top, about one year ago. 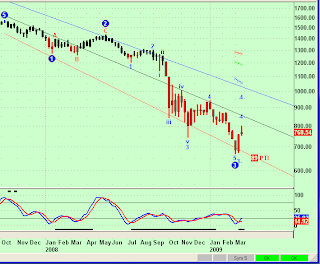 If this week's bar stays above the channel, a compelling case for that larger "Primary Wave 2" rally. Recommended last December at 22c a share. Closed today at 52c. This is the one that some wise guy claimed I was pumping and dumping. That's over 100% in about three months. Might have to re-define pump and dump, eh? At the suggestion of a reader, Jack, let's take a step or two back and look at the bigger picture in hope of gaining some perspective on market direction. Your first impression? Right, "Double Top". Prechter calls the this pattern as a Wave 5 Top in 2000, followed by an A wave down into 2002 and then a B wave up into 2007. That's leaves us in a C wave down and Prechter's targets are much, much lower then the 1990's lows at the far left of the chart. The issue we will be wrestling with over the next few weeks or months is whether or not Wave 3 down is complete (A completed five waves down from Wave 2 high) or if there is still another low coming to complete that cycle. For the past six months, it was pretty clear that Wave 3 was unfolding on this Weekly chart, ergo my steadfast bearishness. That clarity has recently become muddled in the potential that the entire Third Wave may be complete. 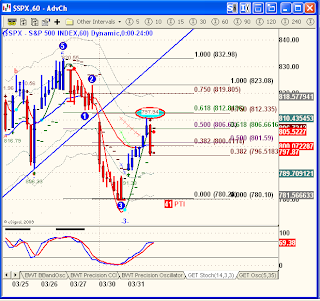 The implications of that possibility can be seen on the above chart as the projected targets for Wave 4, 850-1000 on the SPX. A few weeks ago Prechter went from Short to Cash in the expectation that this massive decline would soon take a respite, one that would last for months and several hundred SPX points higher and one that he felt most comfortable sitting out. His short netted him 800 S&P points. Being conservative and possibly leaving some on the table was more of a strategic decision, not so much a market timing forecast. Those of us that do not sell advice but must trade in the trenches every day have another decision to make. Trade on the Long or Short side of this market? Ever since this post on September 10, 2008, that question has been easily answered on the Short side of the market. What has changed isn't so much the direction of the market, but the clarity on that direction. For that, I have been posting shorter-term charts, utilizing proprietary analysis tools, some store-bought, some internally developed and all taking some element of subjectivity into consideration for day to day and even hour to hour trading. But as Jack suggested, keeping an eye on the big picture, from where we have come to find ourselves at this time and at this place in the overall price patterns measured in years and not minutes, gives a perspective that can only be gleaned by stepping back, taking a breath and having that, "ah-ha" moment. Back to the shorter-term, next time. A continuation of the previous two posts, exemplifying of how all of this came together, the charts, channels, wave counts, Blue Wave and now FBS Trend appearing on the 15 minute charts. 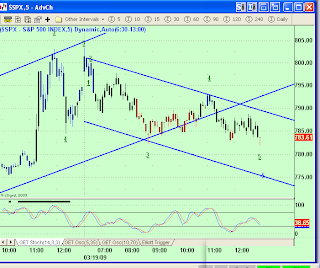 BW (left chart) = Still in down trend, but any decent strength could flip it blue (UP). Which Channel will prices choose? 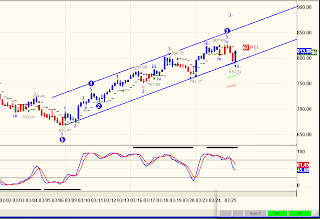 Wave 4 Buy Signal, confirmed with False Bar Stochastic. Stop just below previous low. Those are some very long bars that came in Wednesday after the Fed announcement. I will be very surprised if these bullish bars don't prove to be harbingers of some big moves and not just limited to the Gold markets. You know what makes a great hockey player? The kind that dominates the game every 30 second shift he's on the ice, the Number 13 in the Red Winged Wheel that has the entire arena transfixed on his every shift, expecting highlight reel moves whenever the puck hits his stick. Then 20,000 stand at once in wide-eyed disbelief as his special magic simply wills a black round disc behind the sprawling, helpless goaltender. He stops and turns toward his mates, a shy perky smile peering out from under his oversized visor skating back to his place in our hearts and hockey greatness, another moment of history in awe of a kid who learned to play in Siberia, while waiting for this time and this place. 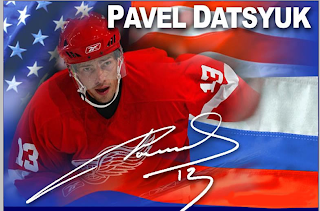 What makes Pavel so great? He knows where he is every second, where the puck is, where his line mates are, where the opponents are, where and how its all coming together and then lets instinct take over, instinct learned from hard work and discipline. So it is with us. Here are the charts, there is nothing more that can be known, just see where we are and when the bell rings at tomorrow's open, let your instincts and command of these tools lead you in the right direction. Comments? You want comments tonight? We don't need no stinkin' comments. Get out there and skate. It has come to my attention that some are having difficulty paying attention to intra-day swings. So let's try something a little more basic tonight. 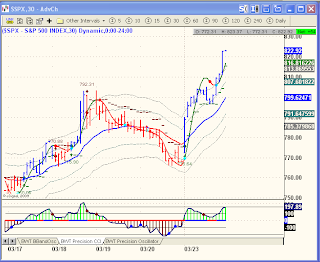 The LONG signal has carried from 712.56 to 778.12. Now I do not trade the Dailies because I find that the same principles can be applied to intraday time frames for more profitable and efficient capture of points. Although there are instances when just playing the end-of-day charts is the best course of action to take, I believe those are the exception to the rule. 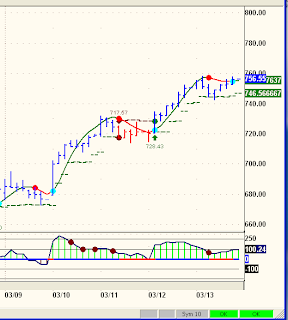 Nonetheless, the past week has seen a 60 point up move that was captured best with the end-of-day charts. 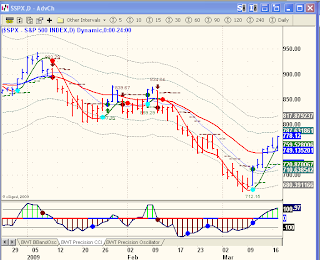 You can see from the Daily signals on the chart that even this long a time frame is a robust and profitable trading system. If for whatever reason changing course intraday is not for you, find something that works end-of-day (like this) and use it. The market did the expected by doing the unexpected which turned into the expected by the close of Monday's session. As the above charts indicate, the market ran up early and then topped around mid-day, falling far and hard enough to trigger SELLS on both the Blue Wave Trend Chart and the Elliott Wave 4 channel break. Why skip the first three hours of rally? Most of it came pre-market and by the time the market opened, I felt that there was so little left to the upside that it wasn't worth the risk. In case anyone is paying attention, that is not how to trade trends. You just go with the direction of prices and don't think too much about things like risk and reversals. That's why I wrote, "My bad," above. Even Nostradamus screws up. As one of you pointed out, that False Bar Stochastic is flattening out suggesting the possibility of this small uptrend continuing. But the position of the channels don't allow for much upside before something else, something more bullish, is triggered. On the other hand, a drop now below that rising Wave 4 channel will almost certainly lead to new lows. Unlike Nostradamus, I can't tell which way it will go, but I do know what to do in either case, Up is bullish, Down is bearish and Caesar should have stayed home this fateful day in 44 B.C. 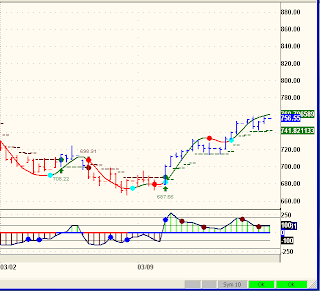 Above is the 30 minute BW chart. It flips SHORT on a six point S&P decline. 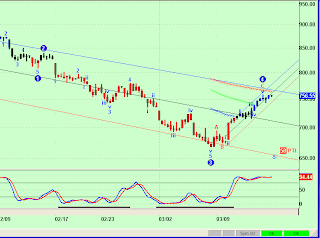 That should coincide with the break of the Wave 4 channel on the above EW chart. 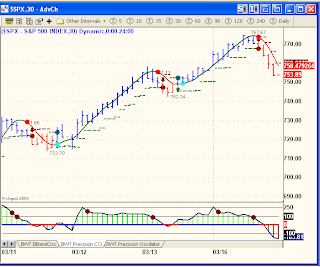 If both systems trigger, it is a high probability SELL SIGNAL. One last chart. Below is a Weekly Blue Wave Trend Chart. 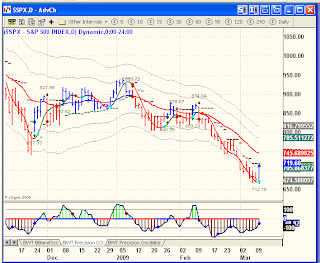 It was posted above alongside the EW chart as my first chart in this post. 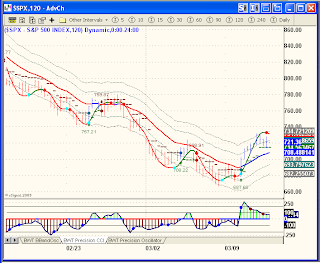 Here it is isolated by itself because I want to point out the level as of now at which it will turn bullish: 807.10. If the S&P should hit that trigger, everything gets reassessed. We've seen this exact pattern over and over again in the past six months, each and every one of these patterns has resulted in a breakdown to new lows. Actually, all these blogs are messages from me, so what's so special about this one? I've been receiving a lot of questions these past few days about what to do and specifically, has some sort of low been set and is a new bull market in the making. Feedback has also made the point that these charts, Blue Wave and Elliott are nice to look at but they don't know what it all means, i.e. is the market going up or down? Maybe this will help explain what I am trying to do here. First, the Elliott Wave charts are pattern recognition puzzles, where by labeling the past I am trying to forecast the future. This is possible because the Elliott Wave Principle is a set of rules and guidelines. By plugging in the patterns of the immediate past and then applying those rules and guidelines, we can sometimes make high probability forecasts for the immediate future. Not every high probability forecast pans out, but enough of them do to make the exercise very much worthwhile, especially when the forecast can be confirmed with other, independent technical analysis techniques. The Blue Wave charts are one of those other technical analysis techniques. Unlike Elliott Wave, Blue Wave's forte is identifying tradable trends early enough to ride the trend to a profitable resolution. The time frames, Weekly, Daily, 120 minute, 60 minute and so on are all independent systems that allow the user to trade as often or as infrequently as is comfortable. The incredible overriding characteristic of each and every trend, long or short, is that they all work. I try to show different time lengths in my blogs on Blue Wave as a way of illustrating how well the basic underlying algorithm works. As with Blue Wave, the Trade Triangles are also a rule based trend following system, simply trading in the direction of a, "three period high or low." Yes, you can simulate this without joining Market Club, but my suggestion is that by paying for it you will be more likely to use it. There is nothing like an up or down arrow (or triangle in this case) to motivate a trader. Each one of these trading systems has costs associated with using them, both in time and in money. My time is worth a lot to me, so I don't mind spending money to help me trade without working 18 hours a day figuring all this stuff out. As an example, being short earlier this week paid for Blue Wave, as did being long today. Same with Triangles and Elliott, if they generate profitable trading, what difference does it make how much it costs? Finally, a word about what's coming next. 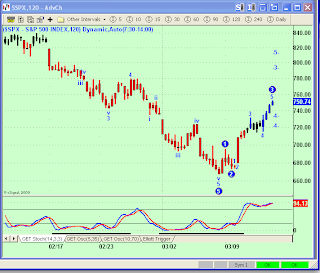 Both EW and Weekly Blue Wave are steadfast that much lower prices are coming. As I said recently, the market has up to about a 100 point rally in it before those forecasts may be threatened. My own opinion is that the rally is more then half over, maybe a lot more then half over. When the longer term BW bars (120 minutes are higher) flip back to red-Sells, I suspect a decline to new lows will be at hand. If I am right, then the profits that can be made from that decline will drarf any gains being missed by not being long during this rally. I hope this adds some perspective on what I have been posting recently. The links and advertisements for Market Club (Trade Triangles), Blue Wave Trading and Elliott Wave International are for your convenience, if any of you want to give these products a spin. If you have the time, you could possibly figure much of this out by devising your own rule based trading system without buying any of these systems or services. But will you? To each his or her own, but rest assured, these services wouldn't be on my blog if they didn't work. 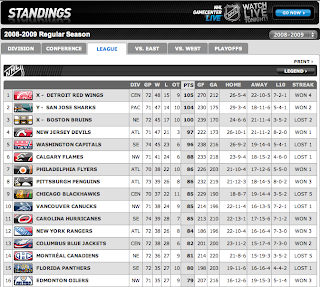 As for the rest of 2009, the best is yet to come. As of the open Thursday the Sell signal comes in at about 715, just about six points lower from where the SPX closed Wednesday. There is only so far an end-of-day analysis can go and this is about it. I can make either case for Thursday, so I made them both. Each week Elliott Wave International sends out recommended "content" to affiliates like AllAllan. This week's article was especially worthwhile. Elliott Wave International, the world’s largest market forecasting firm, receives thousands of questions every year from web site visitors and subscribers on their free Message Board. Here the company shares 6 of the recent critical questions on the financial crisis and 6 answers provided by their professional analysts. For more free questions and answers or to submit your own question, visit Elliott Wave International’s Message Board. Q: Can increased government spending help stop the crisis? In Ch. 13 of his Conquer the Crash, “Can the Fed Stop Deflation?”, Bob Prechter writes; quote: "Can the government spend our way out of deflation and depression? Governments sometimes employ aspects of' 'fiscal policy,' i.e., altering spending or taxing policies, to 'pump up' demand for goods and services. Raising taxes for any reason would be harmful. Increasing government spending (with or without raising taxes) simply transfers wealth from savers to spenders, substituting a short-run stimulus for long-run financial deterioration. Japan has used this approach for twelve years, and it hasn’t worked. Slashing taxes absent government spending cuts would be useless because the government would have to borrow the difference. Cutting government spending is a good thing, but politics will prevent its happening prior to a crisis. ... Prior excesses have resulted in a lack of solutions to the deflation problem. Like the discomfort of drug addiction withdrawal, the discomfort of credit addiction withdrawal cannot be avoided. The time to have thought about avoiding a system-wide deflation was years ago. Now it’s too late. It does not matter how it happens; in the right psychological environment, deflation will win, at least initially." Q: In deflation, what's best: to have no debts or preserve capital? During a deflationary period, if you had to choose one or the other – debt reduction or preservation of capital – which one is MOST important? In Ch. 29 of Conquer the Crash, "Calling in Loans and Paying off Debts," Elliott Wave International’s founder and president Bob Prechter writes; quote: "Being debt-free means that you are freer, period. You don’t have to sweat credit card payments. You don’t have to sweat home or auto repossession or loss of your business. You don’t have to work 6 percent more, or 10 percent more, or 18 percent more just to stay even. ...the best mortgage is none at all. If you own your home outright and lose your job, you will still have a residence." Of course, one could pay off some debts AND keep some capital – it all depends on an individual's risk appetite and tolerance. Q: Which news and events can move the market and which can't? I've noticed that a lot of times, the stock market does the opposite of what the news suggests it should do – or does nothing at all. Can you make a distinction, if there is one, between news that does not move the market and the news that does? I'm talking specifically about the news and anticipation of another bailout plan plus stimulus package that is supposedly rallying U.S. stocks right now. The subject of the news is almost irrelevant. What IS relevant is the state of investors' collective mood at the time of the news release. If they feel bullish (or bearish), they will interpret just about any news story as bullish (or bearish) too. (Or "dismiss the news," as financial commentators often put it.) If you need a good example, just compare the February 6 horrific U.S. jobs report with that day's rally in the DJIA. Or, contrast the February 10 passage of the "$838 Billion Economic Stimulus Package" with a 300+ drop on the Dow. The important thing to keep in mind is that while the news can cause short-term price spikes, it has no effect on the longer-term trend; only social mood does. Q: If this deflation deepens, will the US dollar crash? Bob Prechter’s Conquer the Crash and your monthly publications like Bob’s Elliott Wave Theorist, you've been saying that in deflation, "cash is king" as the value of the dollar rises. But won't the U.S. government's spending spree cause the dollar to crash instead against the euro and other currencies? It's very important to make a distinction between the dollar's domestic and international values. In a deflation, the value of any currency – the U.S. dollar, in this case – rises domestically: As asset prices fall, each unit of currency buys more domestically-available goods and services. "Cash is the only asset that assuredly rises in value during deflation." – Bob Prechter, Conquer the Crash, Ch. 18. However, the USD's international value (as represented by the U.S. Dollar Index) in a deflation can rise OR fall relative to other currencies. If, for instance, the euro is deflating faster than the dollar, then the dollar's value relative to the euro will rise, and vice versa. Q: Won't government bailouts turn deflation into inflation? Trillions of dollars in bailouts "injected" into the economy – won't they reverse deflation and turn it into inflation instead? Here is a quote from Bob Prechter’s October 2008 Elliott Wave Theorist: "Believers in perpetual inflation think that the government can keep assuming others’ bad debts infinitely. But it can’t. The only reason that Congress has gotten away with issuing this latest blizzard of new IOUs is that society is still near the top of a Grand Supercycle, so optimism and confidence still have the upper hand. But as pessimism and skepticism continue to wax and the economy contracts, the bond market will figure out that the Treasury will be unable to fund all these obligations with tax collections. Then Treasury bond prices will begin falling as if they were sub-prime mortgages. A collapsing bond market is deflation; it is a contraction of the outstanding credit supply. Recent bailout schemes will not reverse the deflationary freight train. They will serve only to confuse the marketplace and hinder the efficient retirement of bad debts, thus exacerbating the crisis and aggravating investors’ uncertainties and thereby falling right in line with the declining trend of social mood." Q: When will recession end – and DEPRESSION begin? When do you think the economic DEPRESSION will officially begin? It took mainstream economists over a year to recognize the "official" start of the recession! Because a depression is a much bigger and rarer event, the delay with its "official" recognition will likely be even greater. Not to mention the fact that, interestingly, there is no "official" definition of a depression; even if there were one, ours here at Elliott Wave International would probably differ. Rest assured, though: We intend to update subscribers on any "progress" in that direction. To read 30+ additional questions and answers on the financial crisis, investing, capital safety and more, visit Elliott Wave International’s free Message Board. Tuesday's open gapped right up above our Blue Wave Trading Buy-Stop of 685.07, setting the stage to go long and stay long into the close @ SPX 719.60. 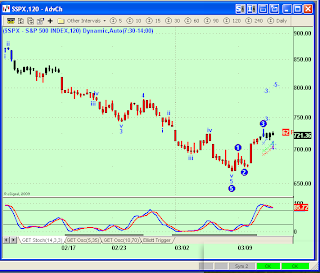 Note, five waves down on the right and a new Daily Blue Wave Buy Bar on the left. Only the Blue Wave Weekly Bars are still red, way up at 805.30. It is conceivable that this rally phase will never get that far and that holding Short throughout the retracement will pay off in the long run. Most of us are traders though and holding short through a 100 point S&P rally is the antithesis of a rational life. Above is a 120 minute, or two-hour bar chart. I like this time frame for it's combination of large wins with minimal whipsaws, but those two-hour bars can be killers in a wishy-washy market. Still, as a frame of reference it covers well what we are up against here. 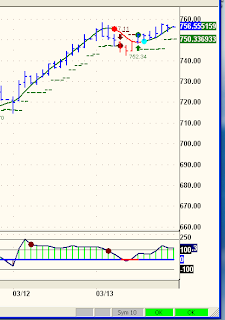 That False Bar Stochastic on the right is getting perilously close to overbought. Good to know, especially if the rally takes a snooze tomorrow. Here is our first indication that Elliott is coming along on this one. It is counting a five way advance with still a good ways to go, consistent with the Blue Wave chart on the left. But again, an ominous False Bar Stochastic looms. 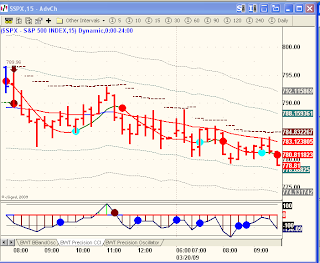 Above are the 60-minute charts and a new wave count on the right. Now that FBS is beginning to make sense. 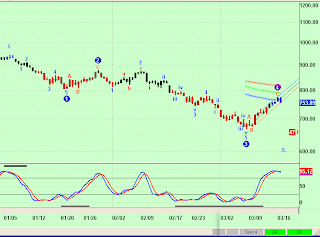 This entire rally from late Monday may very well only be a Fourth Wave Bull Trap. Blue Wave defines our risk, 706.09 is where BW flips Short on this chart, which if it occurs, will coincide with a breakdown of the 4th Wave trendline (not shown). We know what that means......new lows. This is arguably the most bullish of the charts tonight. 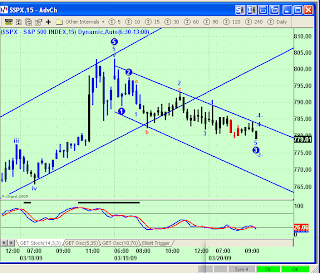 A robust five wave advance on the right and a very bullish looking Blue Wave trend on the left. The FBS on the right looks about ready to enter a trend mode and if it does, we disregard any FBS Sell signal, as it will mean the index is entering an established uptrend.